Towards a Political Theory of the University argues that state and market forces threaten to diminish the legitimacy, authority and fundamental purposes of higher education systems. The political role of higher education has been insufficiently addressed by academics in recent decades. By applying Habermas’ theory of communicative action, this book seeks to reconnect educational and political theory and provide an analysis of the university which complements the recent focus on the intersections between political philosophy and legal theory. In this book, White argues that there is considerable overlap between crises in democracy and in universities. Yet while crises in democracy are often attributed to the inability of political institutions to adapt to the pace of social and cultural change, this diagnosis wilfully ignores the effects of privatisation on public institutions. Under present political conditions, the university is regarded in instrumental and economic terms, which not only diminishes its functions of developing and sustaining culture but also removes its democratic capabilities. This book explores these issues in depth and presents some of the practical problems associated with turning an independent higher education system into a state-dominated and then, subsequently, marketised system. 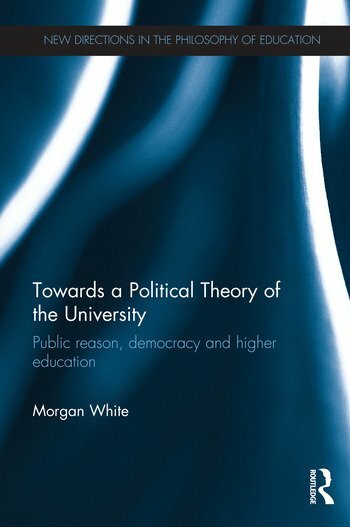 This book bridges political and educational theory in an original and comprehensive way and makes an important contribution to the debate over the role of the university in a democracy. As such, it will appeal to researchers, academics and postgraduate students in the fields of the philosophy of education, higher education, and political and educational theory. With its implications for policy and practice, it will also be of interest to policy makers. Morgan White was a tutor in Philosophy of Education at University of Cambridge, UK and a lecturer in Education at Liverpool Hope University, UK. He received his PhD from University of Manchester, UK, and has a particular interest in the public role of higher education, social justice, deliberative democracy and tensions with instrumental learning.